WouldYouRatherMath.com has been a huge part of the MEL3E course that I’ve written about here, here, and here. 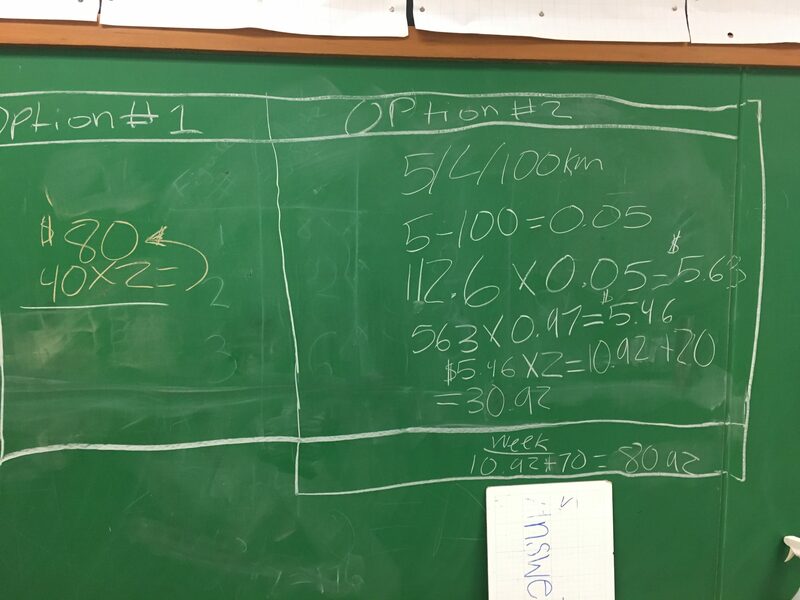 Having my students pair up and work on the chalkboards and vertical whiteboards toward a choice opened up great discussion, and improved our classroom atmosphere! For a while our classroom atmosphere was a little shakey….but the warm ups and paired work has brought us closer together. Download the MS Word docuement that has all the warm ups week by week for this class. The idea and format of the document I took from Mary Bourassa’s Warm up file. 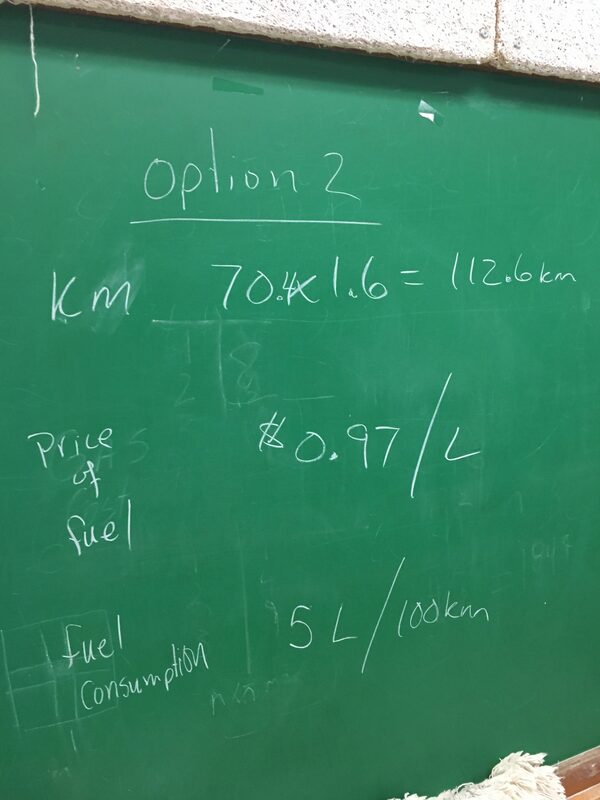 I asked the class to make a gut check on which option pulled them immediately….and most said drive yourself. Ok….let’s verify that gut check. “Is there anything we would need to know more about?” A few students had some ideas and we worked as a class to narrow down some open items. Does each have to pay $40 each way? 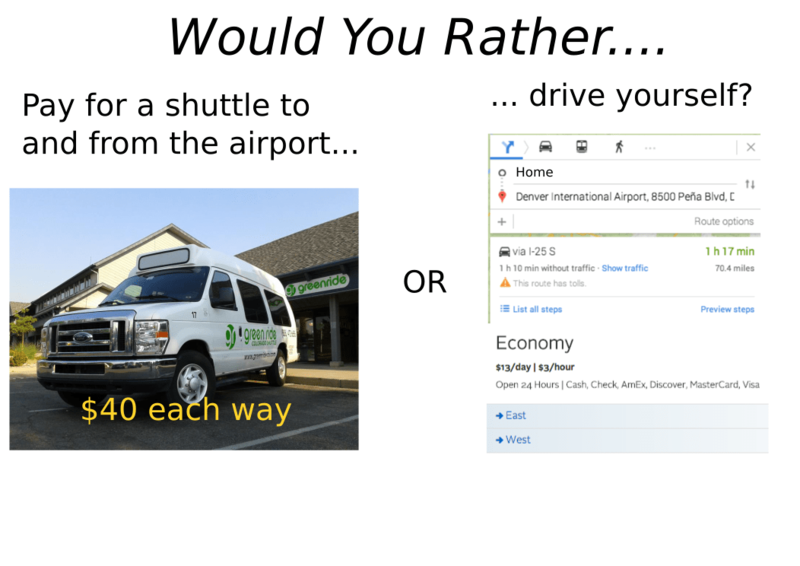 Do you have to drive to the shuttle? Do you have to pay for parking in option 2? Are we taking into account getting a speeding ticket? insurance on the car? wear and tear? The conversation that comes out of this warm up was great for us. So many questions and lots of answers. Most groups changed their minds after great debate to take the shuttle (if they were going on a trip for a week)…..less hassle.  This is not really a fix yet…but I wanted to grab some thoughts from you. On the weekend Jules and I worked on some puzzles. After we dumped the puzzles out I would ask her how big would the puzzle be? She would look up and with that wonder look and say pretty big or pretty small, but nothing exact….she’s only 6. So I would narrow the question down. How many pieces would be along the bottom? Along the side? And she would make a guess. We would do the puzzle and then find out. Jon, I saw a series of lessons that I think were yours where students built a marble maze. It was tied to budgeting etc. in MEL3E. Was this you? I am looking for hands on activities for a MEL3E crew.